CollarFolk - Take your pet along on the holiday! Going out on a vacation and worried where to leave your precious pet? Planning to spend some activities with your pet but unsure of what to exactly? Well, if these things concern you, don’t hassle up, here might be something that will help you and result in providing you tension free solutions. CollarFolk helps you to plan vacations with your pet buddies. It’s pretty simple, Browse through the options, Reach out to the holiday managers, Book and Check-in; be welcomed with your pet. They help you to plan your detailed itinerary with the activities that you could share with your pet during your vacation. Holidays range from a drivable weekend getaway close to your city to a trek up the Himalayas with your pet. Pet Picks – A curation of the most pet friendly rooms. These rooms are personally vetted to meet stringent requirements that are ideal to host pet parents. E.g. Pet Sitters, Private Open Spaces etc. Additionally, all of the Pet Picks have pet menus in place, after all your pet is on a vacation too. Experiences – These includes activities ranging from nature trails, camping, treks and kayaking. A Holiday Manager – The Holiday Manager helps you in selecting the right place basis the time of the year, the nature of your pet and various other factors. The holiday manager remains accessible to you even during your holiday for any additional assistance and help. Vet On Call – All the clusters have vets on call and have pet shops nearby in case required. Travel Planning – Since pet travel is different from normal travel plans. They play an active role in planning your trip be it road, air or travel by train. “As a pet parent for a majority of my life, I have experienced the inconvenience of traveling or not traveling with my pet on vacations. Choosing sub-optimal options is not just difficult but heart wrenching. I either had to leave a family member behind or have trustworthy domestic help stay back. All this meant multiple calls back home to check on them and on numerous occasions waiting for the vacation to end to be back with them. Today the options remain equally difficult ranging from pet boarding facilities to kennels. Who all the team consists of? Rukmini Vaish is a Pet lover, pet parent to Jack, Zara and Kiki. Vijay Chandrashekar, Dog person, shares his home with the mighty Thor and Kaiser. Having worked across verticals and roles has been a core to his experience. Starting with M&A deal experience with the Mahindra Group, he moved on to the Axis Capital(erstwhile ENAM) as part of their investment banking division before returning to the Mahindra Group to be a part of the setup team for US 2Wheeler (electric) business after which he led the restructuring of their domestic 2 wheeler business. His last stint was with Mahindra’s PE & incubation cell within the Group before moving on to manage the India Portfolio of a global Impact investment fund. He completed his B.Com from HR College in Mumbai and has a management degree from SIBM, Pune. The traction so far has been very interesting as they launched their website in late Feb 2016. In total they had 400+ transactions. 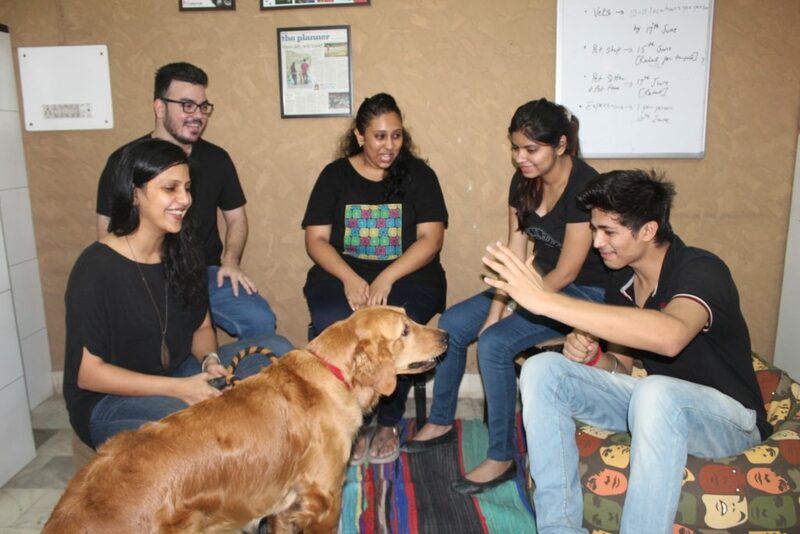 They believe to continue to see rapid growth in both their verticals (Pet Taxi and Pet Holiday). The company consist of 120+ partners for their holiday verticals, and presently they are looking at some very encouraging initial responses for their new product offerings as well. How did they get their first Customer? Rukmini says, her first customer was a pet taxi customer. She decided to give it a try and put up posters at a couple of vet clinics hoping to succeed with a plan in Delhi City. The team didn’t hear their phone ring for 15 days. Just when they thought they should get back to the drawing board, they got a call for a ride to the pet clinic on a Sunday morning. Rukmini described, as part of their planning and execution exercise they ensure that they are focused on three work fronts at any given time. Identifying the right skill sets to be a part of the core team at CollarFolk. Drive partner addition and engagement as we look drive scale. Technology based improvement for our product offering. In long term perspective, they aim to establish a brand synonymous with pet travel and vacations, as they look to holistically address a pet family’s pain point during vacationing. They are also in the process of identifying strategic international markets to tap into with their product and service offering. CollarFolk is bootstrapped till date. Also she advises, always have a plan B. Raising capital is time consuming and will not happen as quickly as we would like it to. Ensure you have sufficient runway to keep plugging away while you look to raise capital simultaneously. Biggest challenge you faced as an entrepreneur establishing your startup & how did you overcome it? India has not seen any sizable pet player stand out in the domestic or international stage. Both businesses and customers’ needs to facilitate the evolution of the market, I consider it as the responsibility of any pioneer. It takes careful planning and at the same time thinking on your feet to ensure we don’t take our eyes of the ball at any stage especially when there is an operational business. Who are your competitors and how do you plan to compete them? We do not have any active direct competition. There are a few who are expected to come on stream soon. However, to look at it from addressing their moot point, their competition includes pet boarding service providers and kennels.To stay in the game for a longer duration their strategy is “Product innovation” as it remains key for them. They have the first mover advantage coupled with a steep learning curve of operating in this space for the around 6 months. They believe they will bring to bear their learning as they continue to constantly evolve their product while keep a close watch on customer experience. To stay in the game for a longer duration their strategy is “Product innovation” as it remains key for them. They have the first mover advantage coupled with a steep learning curve of operating in this space for the around 6 months. They believe they will bring to bear their learning as they continue to constantly evolve their product while keep a close watch on customer experience. What is the biggest learning so far in your journey? She proudly says. From a situation where she or her partner would be personally driving their vehicles to meet Pet Taxi demand and later in the day meeting advisors to discuss more strategic aspects, there is no task that is not important. It has helped us not just to get closer to the customer but also confidently deliver on our promise just out of knowing what it takes to have happy guests and customers. What are the plans of expanding internationally? Although India boasts of being the fastest growing pet market in the world, it is yet to become the friendliest. Some of the international markets are more evolved in terms of pet family behavior and service provider understanding of the needs of such a segment. We intend to enter some of the key international markets in future.